James Howard Thome (/ˈtoʊmi/; born August 27, 1970) is an American former professional baseball player who played 22 seasons in Major League Baseball (MLB), from 1991 to 2012. He played for six different teams, most notably the Cleveland Indians, during the 1990s and early 2000s. A prolific power hitter, Thome hit 612 home runs during his career — the eighth-most all time — along with 2,328 hits, 1,699 runs batted in (RBI), and a .276 batting average. He was a member of five All-Star teams and won a Silver Slugger Award in 1996. Thome grew up in Peoria, Illinois, as part of a large blue-collar family of athletes, who predominantly played baseball and basketball. After attending Illinois Central College, he was drafted by the Indians in the 1989 draft, and made his big league debut in 1991. Early in his career, Thome played third base, before eventually becoming a first baseman. With the Indians, he was part of a core of players that led the franchise to two World Series appearances in three years during the mid-1990s. Thome spent over a decade with the Tribe, before leaving via free agency after the 2002 season, to join the Philadelphia Phillies, with whom he spent the following three seasons. Traded to the Chicago White Sox before the 2006 season, he won the American League (AL) Comeback Player of the Year Award that year and joined the 500 home run club during his three-season tenure with the ChiSox. By this point in his career, back pain limited Thome to being a designated hitter. After stints with the Los Angeles Dodgers and Minnesota Twins, he made brief returns to Cleveland and Philadelphia, before ending his career with the Baltimore Orioles. Upon retiring, Thome accepted an executive position with the White Sox. Throughout his career, Thome's strength was power hitting. In six different seasons, he hit more than 40 home runs, and in 2003, he led the National League in home runs with 47. Thome’s career on-base plus slugging (OPS) of .956 is 19th, all-time. In 2011, he became only the eighth MLB player to hit 600 home runs. As of 2017, Thome is the career leader in walk-off home runs with 13. One of his trademarks was his unique batting stance, in which he held the bat out with his right hand and pointed it at right field before the pitcher threw, something he first saw in The Natural. Thome was known for his consistently positive attitude and "gregarious" personality. An active philanthropist during his playing career, he was honored with two Marvin Miller Man of the Year Awards and a Lou Gehrig Memorial Award, for his community involvement. In 2018, Thome was inducted into the National Baseball Hall of Fame. 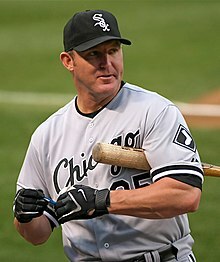 Thome was born in Peoria, Illinois, on August 27, 1970, and is the youngest of five children. Many of the Thome family played sports: Jim's grandmother was hired at a local Caterpillar plant solely to play for the company's softball team; his father built bulldozers for Caterpillar and played slow-pitch softball; his aunt Caroline Thome Hart is in the Women's Softball Hall of Fame; and his two older brothers, Chuck III and Randy, played baseball at Limestone High School. Thome learned to play baseball from his father on a tennis court, and also played basketball in what he described as the "ghetto" of Peoria, noting that he was the only white kid there but that he earned the respect of his fellow players. One day during his youth, Thome sneaked into the Cubs' clubhouse at Wrigley Field in an unsuccessful attempt to obtain an autograph from his favorite player, Dave Kingman. Though Thome received signatures from several other players, this experience influenced him to be generous with signing autographs for fans during his playing career. Like his older brothers, Thome attended Limestone High School where he achieved all-state honors in basketball and as a baseball shortstop. He played American Legion Baseball for Bartonville Limestone Post 979 in his hometown, as well. Although he had hoped to draw the attention of scouts, at just 175 pounds (79 kg) he was relatively underweight for his 6-foot-2-inch (188 cm) height, meaning that he attracted only passing interest—the average Major League Baseball (MLB) player weighed 195 pounds (88 kg) in 1993. Thome graduated in 1988 and, after not being drafted, enrolled at Illinois Central College where he continued his baseball and basketball careers. After one season, he was drafted by MLB's Cleveland Indians as an "afterthought" in the 13th round of the 1989 MLB draft. For the 1989 season, Thome was assigned to the Gulf Coast League Indians, a minor league affiliate of the Cleveland Indians. He finished the year with a .237 batting average, no home runs, and 22 runs batted in (RBIs). After his rookie season, he met "hitting guru" Charlie Manuel, who later became his manager and mentor. Unlike most Indians staff, Manuel saw potential in Thome and worked hard with him, particularly on his hip motion while swinging the bat. Thome later said, "[Manuel] saw something in me I didn't." During this work, Manuel suggested to Thome that he point his bat out to center field before the pitch to relax himself like Roy Hobbs did when batting in the baseball film The Natural. The work paid off; in 1990, Thome hit .340 and totaled 16 home runs and 50 RBIs playing at both the Rookie and Class A levels of the minor leagues. 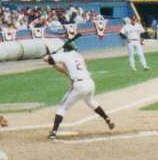 Thome spent most of the 1991 season splitting time between Double-A and Triple-A where, in combination, he hit .319 with 7 home runs and 73 RBIs. The next three seasons were not as successful as the previous three for either Thome or the Indians. In July 1998, Thome hit his 24th home run of that season while helping the Indians end the Yankees' 10-game winning streak. An article in Sports Illustrated published in July 1998 commented that despite Thome's early career success (two All-Star Games and appearances in two of the previous three World Series), he was only "faintly famous" nationally and was not particularly well known outside of Cleveland or his hometown, Peoria. His former teammate Jeromy Burnitz said, "You can't really say he's underrated, because everybody considers him one of the top hitters in the American League, but he's surrounded by so many good players, it's hard to stand out on that team." On December 6, 2002, Thome, who was a free agent, signed a six-year, $85 million contract with the Philadelphia Phillies – he thought the Phillies were closer to winning a championship than the Indians. With the Phillies, Thome's salary rose from $8 million per year to $11 million per year. Thome hit a franchise record 334 home runs in his first stint with the Indians. 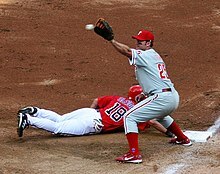 Thome missed a significant portion of the first half of the Phillies' 2005 season due to injury; he compiled only a .207 batting average with 7 home runs and 30 RBIs going into the All-Star break. He had season-ending surgery on his right elbow in August, while his replacement at first base, Ryan Howard, won the NL Rookie of the Year Award. The Phillies traded Thome and cash considerations to the Chicago White Sox on November 25, 2005, for outfielder Aaron Rowand and minor league pitching prospects Gio González and Daniel Haigwood. Though the emergence of Howard made Thome more expendable to the squad, another factor in his trade to the White Sox was his family situation – Thome's mother, the "go-to lady" in his family and his biggest fan, had died a year earlier, and he worried about his father. Since Philadelphia was willing to trade him, Thome waived the no-trade clause in his contract for the good of the team and requested that if possible, they trade him to Chicago so he could be with his father. On August 31, 2009, the White Sox traded Thome to the Los Angeles Dodgers along with financial considerations for minor league infielder Justin Fuller. Thome waived his no-trade clause because he thought the Dodgers could win the World Series, something he had never done during his career, but Thome's only appearances with the Dodgers were as a pinch hitter, due to chronic foot injuries that limited his mobility. Thome reunited with former Cleveland teammate Manny Ramirez in Los Angeles. He hit .235 with no home runs and three RBIs while with the Dodgers (4-for-17). After the season, Thome filed for free agency, eventually signing with the Minnesota Twins. On July 20, Thome hit his first home run with the Orioles, his 610th of all time moving him past Sosa for seventh place all-time, against the Indians at Progressive Field. On August 6, Thome was placed on the 15-day disabled list with a herniated disk; he remained on the DL until September 21. In his first game back, he drove in the game-winning RBI in extra innings against the Boston Red Sox. After beating the Indians in a game where he hit his 611th career home run, Thome said, "There's a lot [of] memories. I've had great memories on that side and then coming in here as an opponent against them. Any time you come home, they say, it's very special. It's even more special to get the W's. That's, I think, the main thing. The bottom line is I played here a long time." Orioles teammates remarked at Thome's commitment to talking about the game while in the dugout. Thome remarked, "I talk the game. When I sit in the dugout during games, I talk baseball to these guys. They'll ask, 'Hey, what's this pitcher like?' or 'What about the game?' 'What about all those Indians teams you were on?' I did it to Eddie Murray when he was in his 40s." The Orioles made the playoffs, but lost in five games to the Yankees during the AL Division Series. Thome hit .133 in the playoffs with no home runs or RBIs. Jim Thome's number 25 was retired by the Cleveland Indians in 2018. On January 24, 2018, Thome was elected into the National Baseball Hall of Fame and Museum. He was formally inducted on July 29, 2018, alongside Trevor Hoffman, Vladimir Guerrero, and Chipper Jones. The Indians retired Thome's number 25 on August 18, 2018. Thome is regarded as a great example of a "pure" power hitter, as indicated by his .278 Isolated Power (ISO) rating. Thome's consistency was a draw for clubs to continue to sign him, even toward the very end of his 22-year career and after most sluggers' productivity fades. In 2011, he was ranked the sixth-best designated hitter in MLB history by Fox Sports. During his career, he compiled a .284 batting average against fastballs but compiled just a .170 batting average against sliders. Since Thome was a pull hitter, opposing teams often employed a defensive shift against him; by playing three infielders on the right side of the field and the outfielders towards his pull side, teams put themselves in better position to field batted balls. In 2011, Lindy's Sports described him as an "extremely patient veteran slugger who launches cripple fastballs and breaking-ball mistakes to all fields", though they did note that he struck out frequently, had poor speed, and should serve only as a designated hitter. During his career, he had strong power numbers; in 15 of his 22 seasons, he had a slugging percentage of over .500. He is an example of a "three-true-outcome" player; 47.6% of his career plate appearances resulted in either home runs, strikeouts, or walks, the highest of all time by nearly seven percentage points. He is a self-described slow runner, but has said that he always hustled. He stole only 19 bases after 1994. Thome began his career playing third base and did so until the 1997 season, when he converted to first base to make room at third after the Indians traded for Matt Williams. Injuries, however, took their toll and confined him almost exclusively to being a designated hitter in the latter stages of his career. Overall, he spent 10 separate stints on the disabled list, mostly for his back. By the end of Thome's career, his back prevented him from playing the field effectively – he played first base four times with the Phillies in 2012, which marked the first time he played the field since 2007 with the White Sox. By the end of his career, writers described him as being a "huge liability in the field". Thome and his wife, Andrea, have two children, Lila Grace and Landon. He has also established funds to put his 10 nieces and nephews through college. During the offseason he lives in Burr Ridge, Illinois. 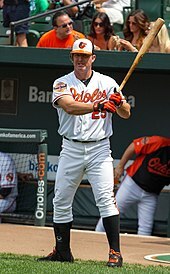 ESPN's SportsCenter reported that shortly after his nephew, Brandon, was paralyzed in an accident, he asked Thome to hit a home run for him; Thome obliged, hitting two in the subsequent game. Thome is also a philanthropist and provided help to the communities surrounding the teams for which he played. In recognition of his community involvement, he was given the Marvin Miller Man of the Year Award in 2001 and 2004, and the Lou Gehrig Memorial Award in 2004. In 2013, after the November 17, 2013 tornado outbreak struck Washington, Illinois, just 15 miles from his hometown, he and his wife pledged to donate $100,000 to relief efforts. Among the philanthropic endeavors Thome and his wife heavily support are Children's Home + Aid, which strives to help underprivileged children predominantly with finding care (e.g., foster care, adoption, etc. ), and an annual benefit to raise money for the Children's Hospital of Illinois, continuing a tradition his mother started years ago. Moreover, the Thomes try "to stay connected with at least one or two organizations in each of the cities" that Thome has played. ^ "Jim Thome Stats". ESPN.com. Retrieved October 25, 2012. ^ "Walk-off home run - BR Bullpen". www.baseball-reference.com. Retrieved November 8, 2017. ^ a b "Jim Thome elected to Hall of Fame". MLB.com. Retrieved January 26, 2018. ^ a b c d e f g h i j Bamberger, Michael (July 13, 1998). "The Pride of Peoria". Sports Illustrated. 89 (2): 98–105. Archived from the original on January 16, 2014. Retrieved April 26, 2013. ^ a b c Verducci, Tom (August 16, 2011). "Thome reaches 600 with humility, grace and country power". SI.com. Time Inc. Retrieved October 14, 2011. ^ a b c d Pluto, Terry (October 1, 1996). "Thome shows power of Peoria Indian: Third baseman's rural roots are apparent in his blue-collar work ethic and his ability to hit the ball a country mile". The Baltimore Sun. Archived from the original on February 1, 2014. Retrieved July 28, 2018. ^ Star, Dave Eminian of the Journal. "Aug. 16, 2011: Limestone teammate: 'He was a competitor and a joy'". Journal Star. Retrieved January 24, 2018. ^ Lee, Christopher (March 26, 2010). "Major League Baseball (MLB) Player Height and Weight". Sportsologist. Archived from the original on November 27, 2013. Retrieved January 15, 2014. ^ Sickels, John (January 21, 2011). "Jim Thome Career Profile". Minor League Ball – SBNation.com. Vox Media. Retrieved September 20, 2012. ^ Posnanski, Joe (September 27, 2010). "He's 40, but Jim Thome's mind isn't on retirement – Page Three". SI Vault. Time. Archived from the original on January 16, 2014. Retrieved April 11, 2013. ^ a b c d e f g h i Palmer, Pete, ed. (2007). Who's Who in Baseball, 2007. New York: Who's Who in Baseball Magazine Co. pp. 169–170. ISBN 0-910692-26-2. ^ The Baseball Chronicle. Lincolnwood, Illinois: Publications International, Ltd. 2002. pp. 592, 600, 616, 622, 650, 656. ISBN 0-7853-7012-9. ^ a b "The Ballplayers – Jim Thome". BaseballLibrary.com. Archived from the original on September 18, 2007. Retrieved July 8, 2009. ^ Housenick, Mandy (October 28, 2009). "Potent Phillies, Yankees bats, homer-friendly parks could mean crowd-pleasing slugfest". The Morning Call. Allentown, Pennsylvania. Retrieved March 7, 2014. ^ "Thome powers Indians". Milwaukee Journal Sentinel. Associated Press. July 14, 1998. p. 5C. Retrieved October 29, 2012. 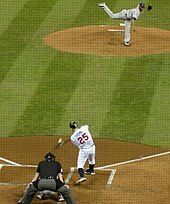 ^ "Thome, Wright spark Indians by Yankees". Lewiston Morning Tribune. Associated Press. July 14, 1998. p. 4B. Retrieved October 29, 2012. ^ "Cleveland Loses Thome In Victory at Tampa Bay". The New York Times. August 8, 1998. Retrieved October 29, 2012. ^ a b Pearlman, Jeff (March 23, 1999). "1999 Sports Illustrated Baseball Preview – Cleveland Indians". Sports Illustrated. Archived from the original on July 25, 2008. Retrieved April 9, 2013. ^ "Indians club Yanks, take 2–1 series lead". Sun Journal. Lewiston, Maine. Associated Press. October 10, 1998. p. C3. Retrieved October 29, 2012. ^ "Indians break playoff jinx; injury sidelines Martinez". The Post and Courier. Charleston. Associated Press. October 7, 1999. p. 2C. Retrieved October 29, 2012. ^ Withers, Tom (September 30, 2000). "Indians clinging to hope". Pittsburgh Post-Gazette. Associated Press. p. D5. Retrieved October 29, 2012. ^ Bryant, Howard (2006). Juicing the Game: Drugs, Power, and the Fight for the Soul of the Major League. New York: Penguin. p. 136. ISBN 978-1-4406-4955-4. ^ "Sources: Phillies, Thome agree to six-year deal". CNNSI.com – Baseball. Time. Associated Press. December 3, 2002. Archived from the original on May 11, 2008. Retrieved January 16, 2014. ^ a b Crasnick, Jerry (August 26, 2011). "Minnesota Twins trade Jim Thome to Cleveland Indians". ESPN.com. Retrieved October 18, 2012. ^ Kimball, Bob (August 26, 2011). "Cleveland Indians reacquire Jim Thome". USA Today. Washington, D.C. Retrieved October 18, 2012. ^ "2003 MLB Team and Player Stats". Major League Baseball – ESPN. Retrieved April 16, 2014. ^ Miller, Stephen (August 26, 2006). "Wolf, Howard help Phillies hold off Mets". The Morning Call. Allentown, Pennsylvania. Retrieved April 18, 2014. ^ "Baseball Roundup; Thome Hits 400th Home Run of Career". The New York Times. June 15, 2004. Retrieved April 1, 2009. ^ White, Paul (August 10, 2005). "Questions about honesty, lefties and public personas". USA Today. Retrieved February 21, 2013. ^ Chen, Albert (August 1, 2005). "First Priority". Sports Illustrated. 103 (4). Archived from the original on February 1, 2014. Retrieved November 2, 2012. ^ Associated Press (November 7, 2005). "Street wins AL Rookie of Year; Howard wins NL". MLB – ESPN. Retrieved February 21, 2013. ^ Zolecki, Todd (April 4, 2005). "A piece of the rock: Jim Thome's mother was his family's foundation. He's building on that". The Philadelphia Inquirer. Retrieved January 18, 2014. ^ a b "For the Record". Sports Illustrated. 107 (12): 22. September 24, 2007. Archived from the original on March 25, 2014. Retrieved March 25, 2014. ^ Merkin, Scott (September 16, 2007). "Thome family shares in joy of No. 500". whitesox.com. MLB. Archived from the original on January 15, 2014. Retrieved April 29, 2013. ^ Gyr, Alex (September 16, 2007). "Thome's quest for 500 ends with win". whitesox.com. MLB. Archived from the original on February 1, 2014. Retrieved April 29, 2013. ^ "Jim Thome's 7 RBIs lead Chicago White Sox past Baltimore Orioles, 12–8". Los Angeles Times. Associated Press. July 18, 2009. Retrieved February 21, 2013. ^ Rogers, Phil (September 2, 2009). "Jim Thome shows once again why he's a throwback player". Chicago Tribune. Retrieved November 5, 2012. ^ Levy, Mike (September 1, 2009). "Ex-Cleveland Indians sluggers Jim Thome and Manny Ramirez re-unite on Los Angeles Dodgers". The Plain Dealer. Cleveland, Ohio. Retrieved April 16, 2014. ^ Hartman, Sid (July 3, 2010). "Thome humbled to pass Killebrew". Star Tribune. Minneapolis. Retrieved April 16, 2014. ^ Kay, Joe (August 16, 2011). "Thome hits 600th home run". Baseball – NewsObserver.com. McClatchy Newspapers. Archived from the original on February 21, 2014. Retrieved November 2, 2012. ^ Abnos, Alexander (June 25, 2012). "Jim Thome hits 13th walk-off home run, an MLB record". SI Wire. Time. Archived from the original on April 18, 2014. Retrieved April 18, 2014. ^ Posnanski, Joe (September 27, 2010). "He's 40, but Jim Thome's mind isn't on retirement – Page Five". SI Vault. Time. Archived from the original on January 17, 2014. Retrieved April 11, 2013. ^ Schelling, Jordan (July 17, 2011). "Jim Thome's mammoth blast, No. 596, lifts the Twins over Royals". MLB.com: News. Archived from the original on June 23, 2012. Retrieved November 2, 2012. ^ Hoynes, Paul (September 18, 2011). "Tribe sends $20K to Twins to complete Thome deal". The Plain Dealer. Cleveland, Ohio. Retrieved March 28, 2014. ^ Bastian, Jordan (September 24, 2011). "Thome's night ends with Santana's walk-off homer". MLB.com. Retrieved November 6, 2011. ^ "Phillies sign Thome to 1-year deal". USA Today. Associated Press. November 4, 2011. Retrieved February 22, 2013. ^ Zolecki, Todd (November 5, 2011). "Jim Thome ready to pinch-hit, play for Phillies". phillies.com: News. Archived from the original on February 1, 2014. Retrieved March 12, 2013. ^ Zolecki, Todd (November 5, 2011). "Jim Thome back with Phillies on one-year deal". MLB.com News. Archived from the original on February 3, 2014. Retrieved April 16, 2014. ^ Associated Press (April 8, 2012). "Philadelphia Phillies vs. Pittsburgh Pirates – Recap – April 08, 2012". ESPN. ESPN Internet Ventures. Retrieved April 29, 2013. ^ Housenick, Mandy (June 16, 2012). "With Interleague soon over, will Jim Thome be just a pinch hitter for the Phillies?". The Morning Call. Lehigh Valley, Pennsylvania. Retrieved February 20, 2013. ^ Kaplan, Jake (June 23, 2012). "Thome's walk-off caps day of Phils milestones". MLB.com. Retrieved June 24, 2012. ^ "Jim Thome hits home run No. 610, seventh all-time". The Seattle Times. Associated Press. July 20, 2012. Archived from the original on February 24, 2014. Retrieved November 29, 2012. ^ Ghrioli, Brittany (August 6, 2012). "Thome out until September with herniated disc". orioles.com: News. MLB. Archived from the original on August 9, 2012. Retrieved November 29, 2012. ^ Ulman, Howard (September 22, 2012). "Orioles Beat Red Sox: Jim Thome lifts Baltimore to 16th straight win in extra innings". Sporting News on AOL. TheHuffingtonPost.com. Retrieved November 29, 2012. ^ "Indians lose to old friend Jim Thome". The Seattle Times. Associated Press. July 21, 2012. Retrieved October 18, 2012. ^ Gonzales, Mark (July 2, 2013). "Chicago White Sox Jim Thome special assistant". Chicago Tribune. Retrieved September 11, 2013. ^ Van Schouwen, Daryl (February 23, 2014). "White Sox' Jim Thome wants to manage in future". Chicago Sun-Times. Retrieved April 3, 2014. ^ Heyman, Jon (March 5, 2014). "Thome loves front office job but if someone offers playing job, well ..." CBS Sports. Eye on Baseball. Retrieved April 3, 2014. ^ "Chipper Jones, Jim Thome Highlight 2018 Baseball Hall of Fame Ceremony". Sports Illustrated. Associated Press. July 29, 2018. Retrieved August 18, 2018. ^ "Indians retire Hall of Famer Jim Thome's No. 25". USA Today. Associated Press. August 18, 2018. Retrieved August 18, 2018. ^ Greenberg, Jon (May 6, 2006). "Notes: Shift doesn't bother Thome". MLB.com: News. Archived from the original on April 23, 2013. Retrieved March 5, 2013. ^ O'Neill, Shane, ed. (February 2011). "Lindy's Sports Baseball 2011 Preview". Birmingham, Alabama: J. Lindy Davis Jr.: 176. ^ a b Posnanski, Joe (September 27, 2010). "He's 40, but Jim Thome's mind isn't on retirement – Page Four". SI Vault. Time. Archived from the original on January 16, 2014. Retrieved April 11, 2013. ^ "Career Stolen Bases – Jim Thome". Sportometry. Tangraph Technologies. Retrieved April 11, 2013. ^ Palmer, Pete, ed. (2012). Who's Who In Baseball. New York: Who's Who in Baseball Magazine Co. p. 175. ISBN 0-910692-32-7. ^ "Thome, Orioles win 16th straight in extra innings". Boston News, Weather, Sports – FOX 25 – MyFoxBoston. Fox Television Stations. September 22, 2012. Retrieved February 25, 2013. ^ Perry, Dayn (August 7, 2012). "Jim Thome could miss rest of season". CBS Sports. Retrieved February 26, 2013. ^ Vetrone Jr., Bob (June 21, 2012). "Our Jim Thome Plan". The Philadelphia Inquirer. Retrieved March 3, 2013. ^ "Jason Giambi, Andy Pettitte among members of age 40 club that are still making impact in majors". NESN.com. New England Sports Network. Archived from the original on March 25, 2014. Retrieved April 9, 2013. ^ Meisel, Zack (August 26, 2011). "Indians welcome Jim Thome back by emulating his high socks". indians.com: News. MLB. Archived from the original on February 21, 2014. Retrieved March 30, 2013. ^ a b Ryness, Gar; Dewart, Caleb (2010). Batting Stance Guy: A Love Letter to Baseball. Simon & Schuster. pp. 32, 217. ISBN 978-1-4391-8172-0. Retrieved March 30, 2013. ^ "SI.com – MLB – SI Players Poll: Friendliest/Unfriendliest MLB Player?". Sports Illustrated. May 16, 2007. Archived from the original on May 22, 2007. Retrieved April 5, 2012. ^ a b Kurkjian, Tim (August 17, 2011). "Jim Thome as genuine as they come". ESPN The Magazine. Retrieved March 30, 2013. ^ Posnanski, Joe (September 27, 2010). "He's 40, but Jim Thome's mind isn't on retirement – Page Two". SI Vault. Time. Archived from the original on January 16, 2014. Retrieved April 11, 2013. ^ Silver, Stephen (January 16, 2013). "Jim Thome's faltering case for the Hall of Fame". Philadelphia Magazine. The Philly Post – News. Retrieved January 15, 2014. ^ "Jim Thome – Statistics – Batting". FanGraphs Baseball. Stats LLC. Retrieved March 14, 2013. ^ Shea, John (August 14, 2011). "Jim Thome has clean reputation amid steroid era". San Francisco Chronicle. Retrieved March 14, 2013. ^ Couch, Greg (August 16, 2011). "In an era of cheats, Thome is a player worth believing in". SportingNews.com. MLB. Archived from the original on January 2, 2012. Retrieved March 14, 2013. ^ Reynolds, Dave (November 23, 2013). "Hall of Fame voters eager for Jim Thome ballot". Journal Star. Peoria, Illinois. Retrieved January 21, 2014. ^ Wessler, Kirk (November 23, 2013). "Why doesn't anyone talk about Jim Thome?". Journal Star. Peoria, Illinois. Retrieved January 21, 2014. ^ Silver, Stephen (January 16, 2013). "Jim Thome's faltering case for the Hall of Fame". Philadelphia. The Philly Post. Retrieved March 14, 2013. ^ "Thome's shot trumps McGwire's slam". Los Angeles Times. Associated Press. July 8, 2001. Retrieved January 23, 2013. ^ Just, David (January 13, 2008). "Thome hosts annual charity event". whitesox.com: News. MLB. Archived from the original on April 7, 2014. Retrieved April 6, 2014. 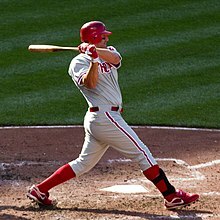 Wikimedia Commons has media related to Jim Thome.